When Columbus arrived in 1492, the first free black person—a sailor—set foot in the Americas. Over the next 400 years, as slavery spread and became entrenched in the Western Hemisphere, free blacks built communities throughout North and South America, playing a critical role in every region, colony, and country. From Canada to the Caribbean to Chile, they established vital economic and social institutions, championed the cause of abolition, and formed a bridge between the worlds of free whites and enslaved blacks. They worked as artisans, farmers, journalists, ministers, merchants, and shipbuilders. Many free blacks served in the military and fought in every major war, including the American Revolution, the Haitian Revolution, and the Latin American wars for independence. Others served in government, and some—like presidents Bernardino Rivadavia of Argentina and Vicente Guerrero of Mexico—became national leaders. Free people of color in the United States and the Americas hold a unique status in global history. Never before and never since has such a group existed in large numbers anywhere in the world. Long shrouded in obscurity and overshadowed by scholarship on slavery and race, the free black community in the Americas has become a growing and vibrant field of study. Historians have recently uncovered vast material on this important group, revealing how they lived, how they shaped society, and how they transformed the history of every nation in the Western Hemisphere. 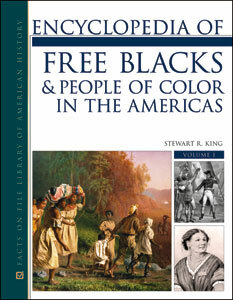 Encyclopedia of Free Blacks and People of Color in the Americas is the first reference to cover this crucial subject and provides a wealth of information not available anywhere else. Arranged alphabetically, this groundbreaking, two-volume encyclopedia includes articles on all major events, issues, and concepts relevant to the free black community in the United States from the colonial period to the Civil War and in the rest of the Western Hemisphere from the late 1400s to the late 1800s, when emancipation became universal. Nearly 400 signed articles cover every country, colony, state, city, and region in the Americas with a significant presence of free blacks, and biographies, thematic articles, and entries on related subjects shed additional light on this vital and fascinating topic.